USC Dornsife College of Letters, Arts and Sciences enriches student experiential learning opportunities across the natural sciences, social sciences and humanities. 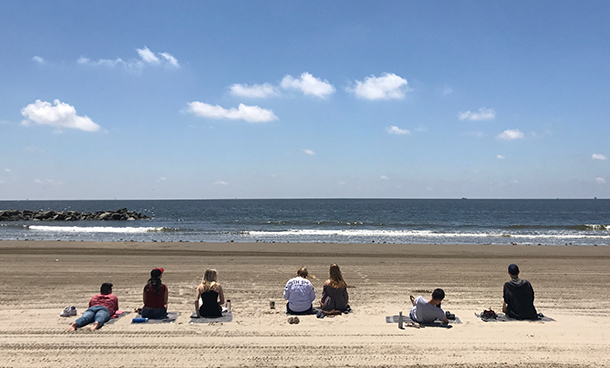 Here, undergraduates participating in the Maymester course "Bookpacking 'The Big Easy': A Cultural and Literary Journey," read on the beach at Grand Isle, Louisiana. The course offers students an innovative form of literary travel in which novels serve as portals through which to explore regional history and culture. Photo by Mike Glier. The USC Dornsife College of Letters, Arts and Sciences is the academic heart of the University of Southern California. The oldest, largest and most diverse of USC's academic divisions, USC Dornsife comprises more than 8,000 undergraduate and graduate students and nearly 900 faculty. The breadth and depth of USC Dornsife is vast with more than 40 academic departments and programs across the humanities, social sciences and natural sciences, and dozens of research centers and institutes. USC Dornsife fosters the liberal arts ethos of small classes and close working relationships between students and faculty within the context of a premier research university, where internationally recognized scholars continuously pursue new ventures. Undergraduates select from more than 150 courses of study and explore opportunities such as overseas studies, service-learning and internships. With approximately 50 doctoral degree and master's programs administered through the USC Graduate School, USC Dornsife not only trains the next generation of scholars, but also ensures that America's research enterprise remains competitive. By immersing its students in deep scholarship and discovery-based learning opportunities, USC Dornsife prepares its graduates to become tomorrow's leaders, prepared to succeed in any field or advanced degree program. Graduate studies leading to the master's and PhD degrees are available within most departments of USC Dornsife. Candidates for graduate degrees must complete both the departmental requirements listed for each degree and the general requirements set by The Graduate School . In addition to the composition of committees outlined by The Graduate School, USC Dornsife requires that all PhD qualifying exam and dissertation committees contain an outside member. An outside member is considered to be faculty outside the student's program but internal to USC. USC Dornsife College of Letters, Arts and Sciences awards the Bachelor of Arts (BA) and the Bachelor of Science (BS) in a number of disciplines. Each degree requires a minimum of 128 units. USC Dornsife students may major in a single discipline or combine several interests in an interdisciplinary program. A major may be chosen because the student is especially interested in a subject, because of particular abilities in certain areas or because it is an especially fitting preparation for a profession. The choice of a major may thus become part of planning for a career. But a choice at USC Dornsife does not limit the student to a single career or line of work. Liberal arts majors are unusually adaptable, and the skills learned prepare students for any career they choose. A student may declare a major at any time but is expected to record his or her major in the Office of Academic Records and Registrar at or before the beginning of the junior year or completion of 64 units. This allows sufficient time to fulfill the course requirements of the major in the student's third and fourth years. For some majors, however, and especially for a major in one of the natural sciences aiming for the BS degree, it is better to declare the major sooner, so the program can be spaced over the full four years. If, after a major has been declared, the student wishes to change to a different field (or add another field of study to the existing one), a Change of Major form must be filed. The form may be obtained in the USC Dornsife Advising Office or the Office of Academic Records and Registrar in John Hubbard Hall. The form must be completed and returned to the Office of Academic Records and Registrar. When a major is changed, the new department adviser must sign the form. A departmental major for the BA degree consists of specified lower-division courses and, generally, not less than 24 or more than 32 upper-division units in a single department or discipline. A greater concentration of units in a single discipline is usually required in majors for the BS degree than in majors for the BA degree. A double major consists of two majors that allow the student to earn the same degree, either a BA or BS degree, at USC Dornsife. The student must complete the requirements for both majors and whatever other course work is needed to complete 128 units. Combinations of interdepartmental and department majors are also possible. See the Undergraduate Degree Programs page for rules governing the overlap of courses allowed for a double major. A humanities or social sciences major consists of not less than 32 upper-division units within departments in the humanities or departments in the social sciences. Of the 32 required upper-division units for the interdepartmental major, 20 are typically taken in one department, and the additional 12 units are taken from applicable courses in the area in which the department of concentration is housed. See the departmental listing for more specific requirements for the interdepartmental major, including lower-division requirements. The departments of Chemistry, Earth Sciences, and Physics and Astronomy offer a physical sciences major in the natural sciences and mathematics. The major requires specific lower-division courses in chemistry, Earth sciences, mathematics and physics. In addition, students must take 28 upper-division units that apply to the major from one of the four departments. Of the 28 required upper-division units, at least 4 units must be taken in each of the four cooperating departments. USC Dornsife has a number of special programs, many of which offer majors. A program major consists of designated courses, which include not less than 24 upper-division units chosen from the list of courses that make up the program. Programs are often organized either around the study of a region or a topic that is not specific to any single discipline, or around two or more disciplines that have joined together to deal with a common problem or issue. Program majors are interdisciplinary and offer unusual range to students who have topical interests. Specific requirements for all program majors are listed under the program titles. A dual degree is one that includes course work from two schools or two different degree programs within the same school that have been organized into a single program. Listings of graduate dual degrees can be found under Programs, Minors and Certificates . The student receives two diplomas. A progressive degree program enables a USC Dornsife undergraduate to begin work on a master's degree while completing requirements for the bachelor's degree. The progressive degree may be in the same or different departments but should be in a closely related field of study. Students in a progressive degree program must fulfill all requirements for both the bachelor's degree and the master's degree, except for the requirement of a specific number of units for the two separate degrees. The master's degree may be awarded at the same time as, but not prior to, the bachelor's degree. The student receives two diplomas. Further details about progressive degrees can be found in the Progressive Degrees section in Undergraduate Degree Programs . For some degrees, more than the 32 units beyond the first bachelor's degree will be required because all requirements for both degrees must be met. The student receives a separate diploma for each degree upon completion. The first and second bachelor's degrees may be completed at the same time, but it is not required. If a student wishes to make an adjustment to the major requirements in his or her department or program, the department adviser may, with the support of the department, substitute a comparable upper-division course for a required one. Substitutions and waivers of USC or transfer courses for upper-division requirements are to be limited to 25 percent. Lower-division courses cannot be substituted for upper-division requirements. No more than 40 upper-division units in the major may be applied to any degree under the jurisdiction of the USC Dornsife College of Letters, Arts and Sciences. A student wishing to exceed this limit must obtain the approval of the major department and the dean of undergraduate programs. USC Dornsife offers a wide array of minors that can provide unique breadth and complement or enhance the major field of study. Many of the college minors themselves are interdisciplinary and combine classes in two or more USC Dornsife departments. They may also combine with internships or classes in one of USC's professional schools. For those undergraduate students earning a degree at USC Dornsife, a minimum of 104 units applicable to the degree must be earned in USC Dornsife academic departments. For students graduating with a minor or a second bachelor's degree, this minimum is reduced to 96 units. For students who are earning a degree in USC Dornsife and also a degree conferred by Dornsife but administered by a professional school, this minimum is reduced to 70 units. Other exceptions will be considered by the dean of undergraduate programs at USC Dornsife. This policy also applies to transferable courses (see Course Work Taken Elsewhere ). The student is expected to complete about 16 units each semester; 18 units are generally considered to be the maximum number in a manageable program. If the student wants to enroll in more than 18 units, he or she may do so but first should consult with their academic adviser. A grade point average of at least C (2.0) on all units attempted at USC is required for undergraduate degrees. The college requires a minimum 2.0 grade point average in upper-division courses applied toward the major. Some departments require grades of C or higher in specified courses. A grade point average of at least B (3.0) on all units attempted at USC is required for master's degrees. A grade point average of at least B (3.0) on all units attempted at USC is required for doctoral degrees. USC Dornsife Advising Office provides a wide range of advising services and programs that integrate students, faculty, staff, academic disciplines and curricula into a meaningful educational experience. Academic advisers work closely with students to help them integrate into the academic life of USC Dornsife and provide curricular guidance so students can graduate in a timely manner. Academic advising is mandatory for all students entering USC Dornsife until they have completed 32 units. All students in USC Dornsife are strongly encouraged to seek individual academic advisement at least once each semester until graduation. Guidance regarding academic requirements, policies and program planning is available by appointment or on a walk-in basis. The services of a college ombudsman are available to students who have academic concerns that cannot be adequately addressed by the usual mechanisms of consulting instructors, department chairs or other university offices. The ombudsman can be particularly helpful in the case of grade appeals that are complex in nature. The ombudsman functions as an intermediary between the student, the faculty and other offices on campus. Students who are interested in going to law school consult one-on-one with academic advisers in the USC Dornsife College Advising Office who specialize in this area. Pre-law students are supported in all aspects of the law school application process, including writing an effective personal statement and requesting appropriate letters of recommendation. Pre-law advisers also help students target appropriate law schools and inform students about pre-law and law-related events and student organizations. Pre-law students are also invited to subscribe to an email listserv sponsored by the USC Dornsife College Advising Office to stay connected with pre-law resources and information. The pre-graduate school advisers assist USC undergraduates and alumni interested in applying to all graduate programs other than law and medicine. The advisers help students determine when and if they should apply to graduate school and guide students in the process of researching and choosing appropriate schools and programs. Students receive support in navigating the admission process, writing statements of purpose, requesting letters of recommendation, exploring test preparation resources, and identifying and pursuing sources of funding. USC Dornsife offers short-term academic programs in several different formats in the United States and abroad. Unique programmatic opportunities; "Spring Break," "Maymester," "Problems Without Passports" and "Departmental Summer Away" courses, extend undergraduate learning outside the walls of the university to just about anywhere in the world. Students gain research experience, participate in problem-based learning courses, study in a foreign country, and are able to add a unique boost to future resumes. The Office of Overseas Studies provides opportunities for students to study abroad for a semester or a year. Eligible students can choose among 55 academic programs in 29 countries. The six-week summer Pembroke-King's Programme at Cambridge University is also offered through this office. Financial aid and scholarships may be applied to the cost of semester and year programs. The Washington, D.C., Semester Program provides a unique, semester-long opportunity for USC Dornsife students to study and work in the nation's capital. The immersive program capitalizes on the D.C. experience. Courses are drawn from areas with direct policy relevance such as foreign policy, politics and the political process and economics. All students complete an internship with one of Washington's many policy-focused organizations, including government agencies, nongovernmental organizations, advocacy groups, think tanks, consulting firms and congressional offices. The USC Dornsife D.C. program is open to students from all majors while maintaining a focus on practical policy, both domestic and international. Established in 1972, the USC Joint Educational Project (a.k.a. "J-E-P") is one of the oldest and largest service-learning programs in the United States. Each year 2,000+ USC students enroll in JEP's service-learning, work-study and volunteer programs. JEP offers a wide range of service and service-learning opportunities in nearby schools, community-based organizations, healthcare facilities and legal clinics. All of JEP's programs combine hands-on experience with reflective practice, enabling students to learn first hand about the critical issues facing the communities surrounding USC. The Levan Institute for Humanities and Ethics is a center of student and faculty engagement in critical inquiry into the timeless values at the core of our humanity. The institute facilitates multidisciplinary programs, events, forums and student organizations to promote moral reflection on the crucial issues of our time. Levan students are encouraged to make a positive impact across society and around the world. The Physical Education program at USC Dornsife has a variety of opportunities for students to improve their general health and strength through fitness related and recreational activities classes. Courses are designed to introduce students to various aspects of health and physical education principles through experiential learning. Students experience a hands-on learning environment by connecting theory and fundamental skill instruction with application of those skills. With this exposure, knowledge, and skill, students are engaged intellectually and physically and are better equipped to make choices regarding a healthy and active lifestyle. The Office of Pre-Health Advisement serves current USC students, alumni and post-baccalaureate students who are interested in pursuing a career within the health professions (e.g., medicine, dentistry, pharmacy, etc.). Pre-health advisers provide an array of student-centered advisement services and support tools tailored to meet the individual needs, interests and goals of pre-health students. The program promotes a sense of community, meaningful relationships with students, staff and faculty, academic excellence, leadership, wellness, and learning through community service, clinical exposure, laboratory research and campus organizations. Pre-health students are supported in all aspects of the health professional school application process, including writing an effective personal statement and requesting appropriate letters of recommendation. The office also offers pre-health curriculum planning, assistance with major and minor selection, and workshops, events and opportunities for clinical, research and volunteer activities. The office encourages involvement in the campus community and pre-health student organizations.